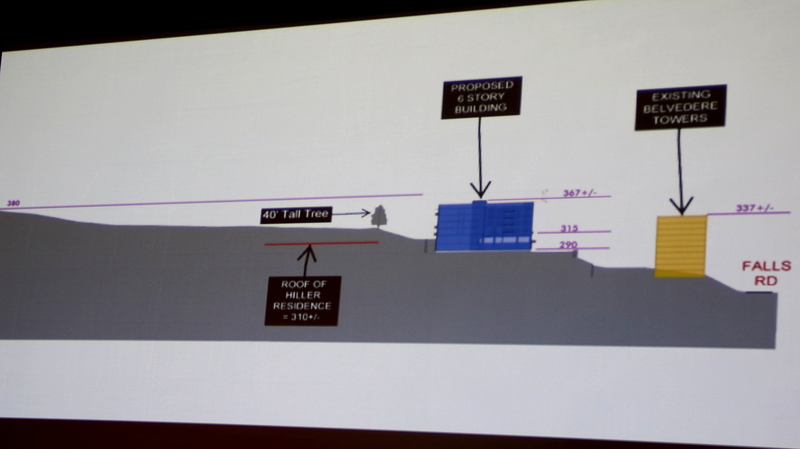 A proposal to build a six-story, 148-unit apartment building on a forested hillside above the busy Northern Parkway and Falls Road intersection drew a capacity crowd to a meeting last night that, at times, turned nasty and confrontational. The Overlook at Roland Park is proposed to be built behind – and stand 30 feet taller than – Belvedere Towers, a massive apartment complex that perches atop an embankment dropping down to Falls Road. 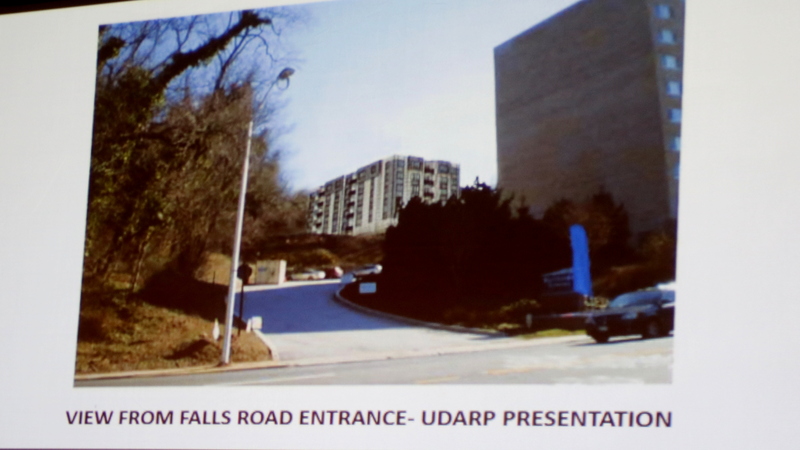 Cars would access the new apartment complex via an entrance on Falls Road. Citing several traffic studies, including a 2015 DuBoff & Associates report, one resident said that Falls-Northern is well-known to be the most dangerous intersection in the city. Kerr Houston, a professor at the Maryland Institute College of Art, showed photos of the backed-up rush-hour traffic he now encounters when trying to get onto Falls Road from his home on Sabina Avenue. 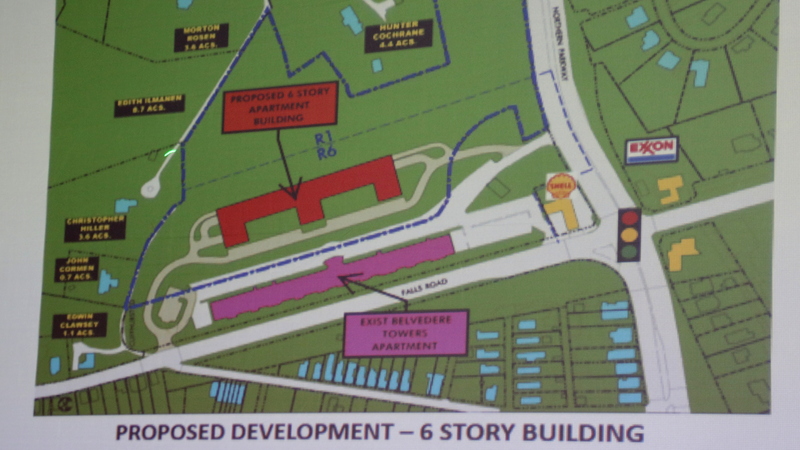 Adding to the rancor in the room were allegations that community association leaders had failed to inform residents before signing off on agreements with the developer, Jonathan Ehrenfeld, president of Blue Ocean Realty in Northwest Baltimore. Mary Ann Mears said she was “appalled” to be told by leaders of the Poplar Hill Association that she and other homeowners could not see the agreement reached with the developer until it was signed last month. She and many others said they were surprised by how far the project had already gotten in the process. 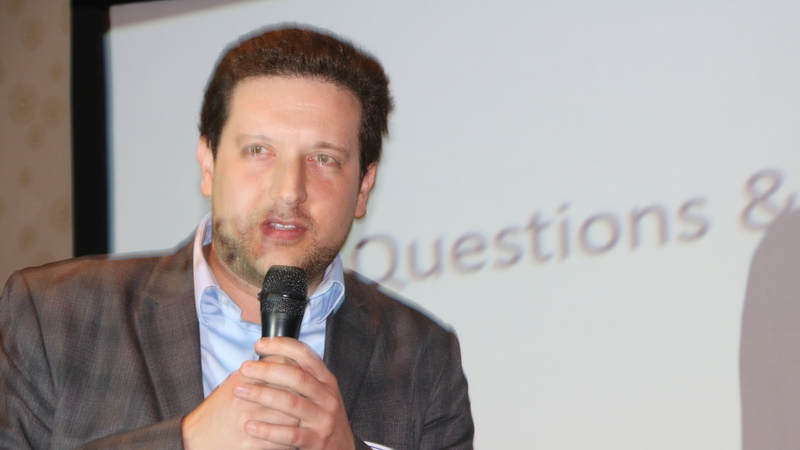 A bill to allow the project to proceed as a Planned Unit Development (PUD) was introduced by freshman Councilman Isaac “Yitzy” Schleifer and was approved by the Baltimore Planning Commission on May 4. “Yitzy, we need you to withdraw the PUD,” she said, addressing the 5th District Councilman, who was seated in the audience. The room erupted into cheers and applause. Councilman Schleifer said he was approached by residents at an earlier stage of the proposal, when it was to be 197 units. “They said, ‘We can’t kill the project – the best we can do is minimize the impact,’ and that is what this has been about for the past six months,” he said. The PUD process, he said, resulted in modifications in the proposal. As for the contention that residents were not informed, Schleifer said that is the responsibility of community association leaders. “It was portrayed to me that certain people in this room represented the voice of the entire community. . . They told me [that] anything that they say, everybody will agree to,” he said, eliciting groans from the audience. “I was misled,” he added. 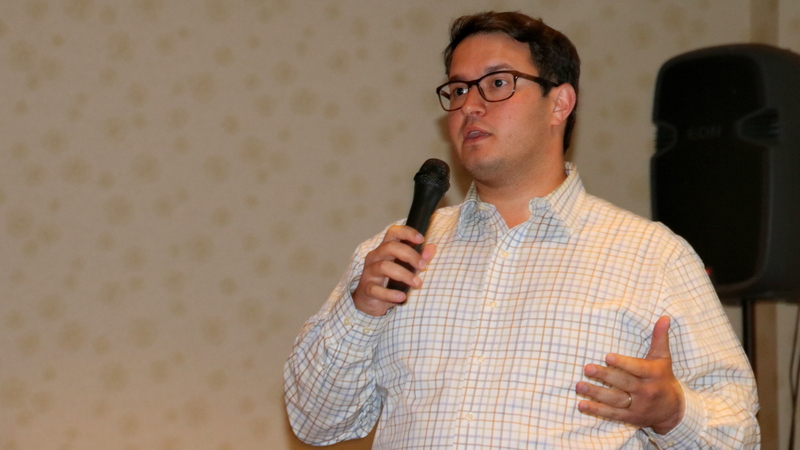 When developer Ehrenfeld’s turn before the crowd came, he led off with an attack on the resident who organized the meeting, Hunter Cochrane, whose property is near the parcel. Cochrane began the meeting by reviewing the history of the project. Built in 1963, Belvedere Towers spawned a controversy that resulted in the creation of the North Roland Park Association. A 50-year covenant was imposed on 12 acres of woodlands east of the complex that limited development there to a 100-unit apartment building. The covenant expired in 2013, and a group controlled by Ehrenfeld purchased the Belvedere Towers property last year. 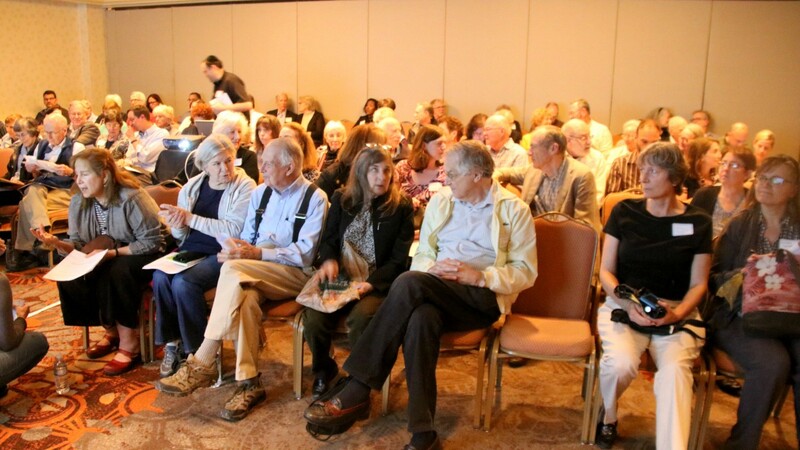 Under the property’s R-6 zoning designation, the developer could potentially build as many as 197 units on the parcel, the audience was told last night. Attorney John C. Murphy offered a different interpretation and explained to the crowd the implication of placing the wooded property under a PUD. He said that Ehrenfeld had applied for the PUD designation before the city’s Transform Baltimore rezoning law took effect last December. By being grandfathered into the new law, the apartment project can be built as high as 80 feet. Otherwise, the Transform law designates that structures in an R-6 zone must stay within a 35-foot-height limit. The result is that “a very high building would be permitted in what is a residential area,” Murphy said, noting that the PUD designation allows future City Councils to approve development with few restrictions and no consultation with the community. 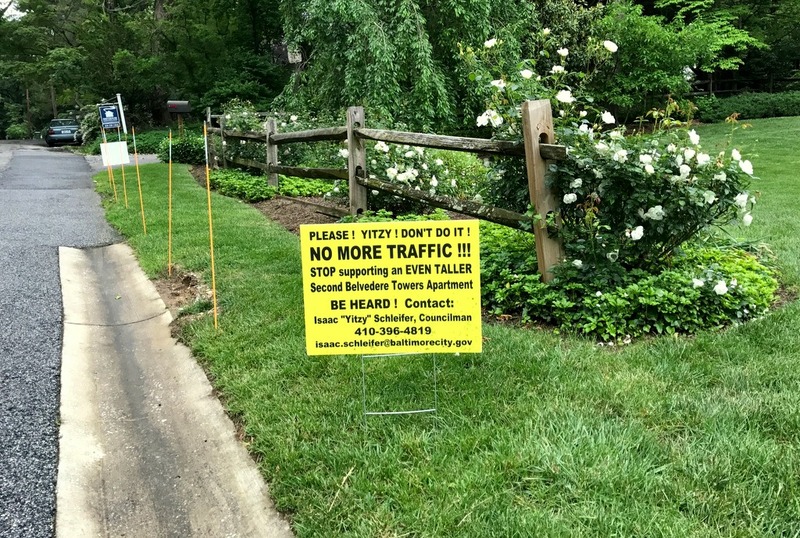 Although most residents at the meeting were clearly opposed to the project, several were not – mostly notably Shelley Sehnert, president of the North Roland Park Association. Sehnert said the association’s officers held many meetings about the project with Ehrenfeld and his attorneys, and she apologized to residents who had not been informed of them. She dismissed critics’ concerns about adding more cars to the Falls-Northern Parkway intersection, which sees an average of 50,995 vehicles between 6-8:45 a.m. and 3-6:45 p.m. every weekday, according to a recent report by Sabra, Wang & Associates, the city’s traffic consultant. “I bet not a single one of you is going to be found mummified in your car because you were there 15 or 10 minutes longer,” she said. Asked why she supported the apartment plan – and sent a letter to that effect to the Planning Commission – Sehnert said she was acting to protect the community when other residents were not able to reach an agreement with Ehrenfeld. “This is private property, this is not community property, this is not public land,” she noted. What Ehrenfeld is proposing “is perfectly legal” and the property owner selling him the land “has a right to make some money on his investment,” she added to audience groans and boos.